In a large traffic circle at the north end of Norodom Boulevard is the temple hill that gave Phnom Penh its name. Legend has it that around 1372 a wealthy widow known as 'grandmother' Penh discovered five Buddha statues in the hollow trunk of a tree washed up on the banks of the river. She created a small sanctuary for the images on a mound near her home. The hill became known as Phnom Penh, literally, Penh's hill. 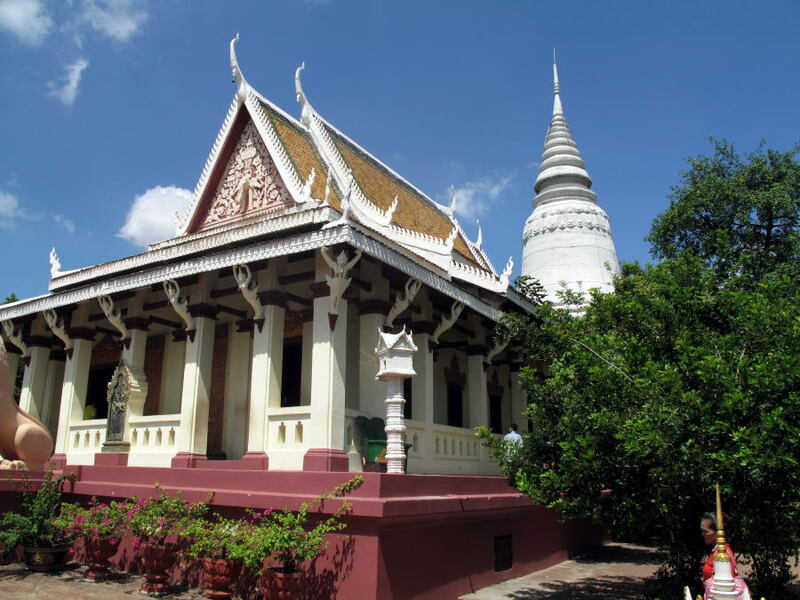 The mound was enlarged and the first temple established here when Phnom Penh became a capital for the first time in 1432. The temple has been rebuilt many times over the years, most recently in 1926. Nothing remains of the original sanctuary, although there is a small shrine to granny Penh near the chapel. The main chapel of Wat Phnom with its stupa behind. You can get to the top of the hill by any of several paths and stairways. The "main" stairway is on the east side, facing the river. On the south side is another grand staircase facing down Norodom Boulevard. The stairs are lined with vendors selling offerings near the top. The summit of the hill is dominated by two large structures: the relatively modern chapel and the large chedi housing the ashes of King Ponhea Yat, who enlarged the hill and founded the temple in the fifteenth century. The tree covered slopes of the hill are a popular cool retreat for locals in early evenings and weekends. There's a troupe of monkeys that provides entertainment, as well as the temple's resident elephant, named Sam Bo. Sam's home is in the fields south of Sisowath Quay, and in the evenings you'll likely spot him on his stroll home. Sam Bo is always happy to stop for a picture if you have a bunch of bananas to feed him. The temple is open every day from dawn to dusk. There's a US$1 fee for foreigners to visit the top of the hill. There's a ticket booth at the base of the eastern stairs, or a guard can collect the money at the top. Around the northwest side of the hill is a small museum. The mostly diarama displays are a bit rudimentary, but there are some interesting photographs on the second floor from the Khmer Rouge era. Admission to the museum is US$2.